I love sharing “what’s in my bag posts“, today i thought i would share with you lovelies, what i carry with me when I go painting. I try not to take to much with me as it will hurt my shoulders making my hand far to shaky to paint, so I often carry the essentials. Today on my doctors orders I went for a nice walk on the walk i stopped for a bit of painting, the best way I relax is sitting amongst nature and trying to capture it whilst the birds are singing. My art satchel is a second hand gift from my brother, it is from Topman but it is the perfect size for all my arty needs. Have you shared a what’s in my bag post recently? 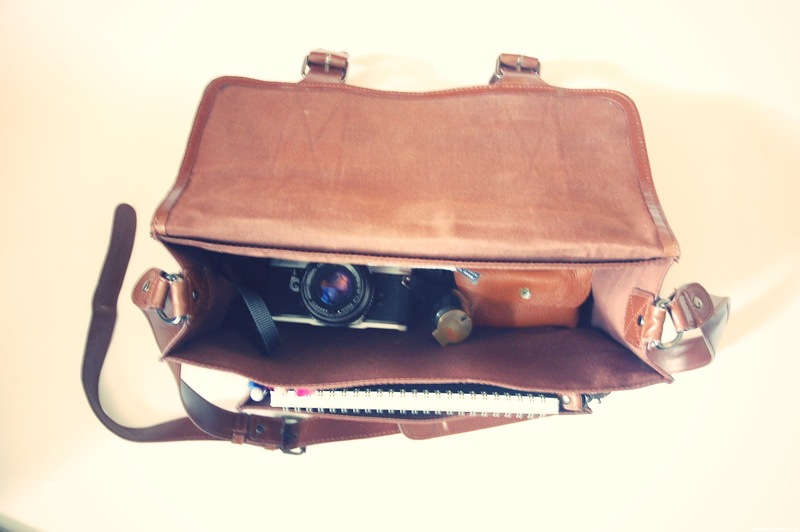 I would love to see what’s in your bag..
Satchels are perfect for an arty bag. I'm dreaming of a bright orange leather one I have seen that is well over my budget. that satchel is lovely, and so is the painting ella 🙂 i think we have the same camera! Oh that bag is amazing! 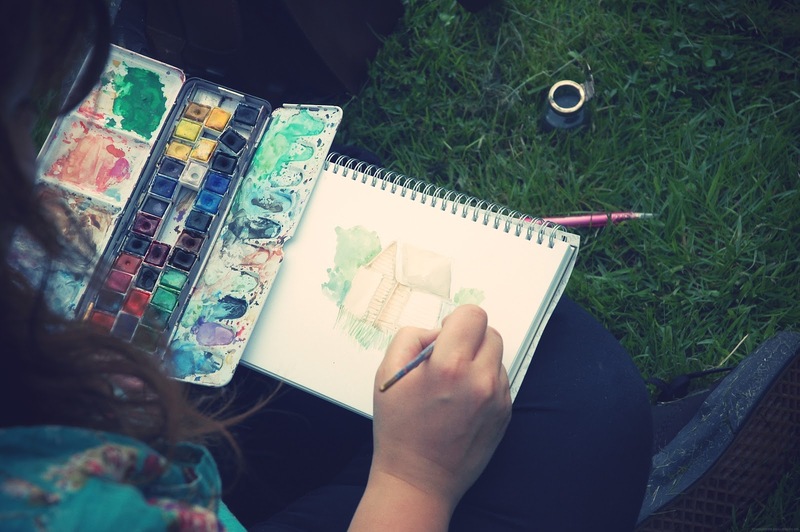 this has really encouraged and inspired me to paint more! your bag and its contents beautiful! 🙂 love those satchel types! That bag is so gorgeous! I keep thinking about getting a nice satchel. I carry pencils, paints and paper when I go into uni, but I bought some journals so I'm hoping to sort of take them on my travels to document bits and bobs I find throughout the day… I just hope I don't look weird whipping out paper and pencils in the middle of places 😛 haha Thanks for your comment too, such a wonderful thing. You are a true inspiration! 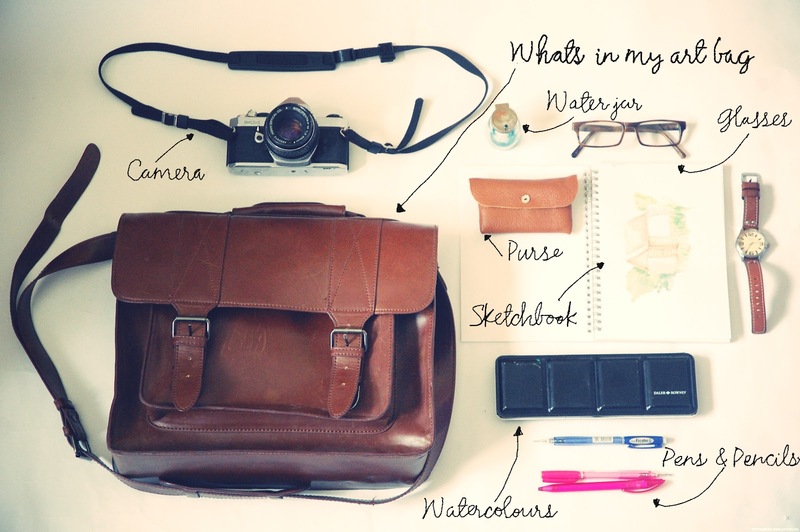 This is a lovely idea to share what's in your art bag! I love the satchel, great for holding everything inside it…and of course it's pretty! I love this and what watercolors do you use? I absolutely love your blog and your watercolours are gorgeous, what watercolour set do you use and where did you get it from? that's such a fantastic bag! I've been searching for one similar for a long while, but lucky you (or your brother) to stumble upon it! Wonderful post! I love this kind of post (especially if there's something else then make up). Your camera looks so nice!